A fish pass and dam associated with the reservoir developed in the 1950s to support the arrival of nuclear power at Dounreay has been upgraded as part of the site's new mission to restore the environment. The UK Atomic Energy Authority has invested £150,000 in improvements to the dam and fish pass at Loch Shurrery - eight miles south of Dounreay. The new facility, which will ease the passage of migrating salmon, was officially opened by Communications Manager, Colin Punler. He said: "The original dam and fish pass at Loch Shurrery was developed by UKAEA in the 1950s as part of our need for a supply of large quantities of freshwater for the experimental reactor programme that was being built up at the time at Dounreay. Under the original terms and agreements, we have been responsible for the maintenance of the facility." "A few years ago, concern was expressed that it was not working to its full potential and consequently inhibiting the migration of fish. We commissioned a number of studies to assess the impact of the dam and fish pass and the options to optimise the flow of water to allow the fish to efficiently traverse the fish pass." "Our mission at Dounreay now is to restore the environment. We no longer need the quantities of water we required when the reactors were operational and therefore we have agreed with NoSWA to transfer responsibility for this facility. But we wanted to make sure we left a legacy that made a positive contribution to the environment and that is why we have funded this investment." 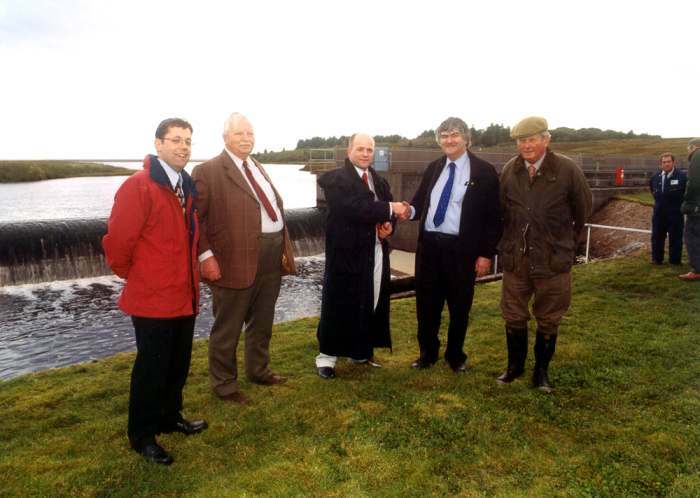 Mr Iain Banks, NoSWA's networks controller for Wick and Orkney, said: "We have always operated sluice gates on the dam since it was built in May 1955 with the aim of helping the fish go up and down the loch. But in October 1996, we altered how much water we released to make better use of flood water and this meant one of our operatives had to visit the site almost daily." "This was time consuming and ideally I should have visited the loch much more frequently because Loch Shurrery has a huge catchment area and a shower of rain does influence water levels." "With the introduction of motorised and computerised gates, paid for by UKAEA, we can control the flows in the pass to a high degree of accuracy 24 hours a day, 365 days a year. That means a better environment for the fish and more efficient system for us." During the work, UKAEA's project management team worked closely with Professor Willie Shearer, an expert in fish migration, Caithness District Salmon Fisheries Board, NoSWA and civil and structural engineers Allen Gordon & Co of Inverness. The installation of the automation equipment was competitively tendered and awarded to local contractor M M Miller. Aided by a specialist diving contractor, the company successfully installed the automated system during the summer of 2001. Care was taken not to disrupt the migration of the fish during the installation period. One of the studies that will continue is the assessment of the population of juvenile salmon in the upper tributaries of Loch Shurrery. This work is being undertaken by Professor Shearer aided by the Environmental Research Institute of the UHI at the North Highland College in Thurso. This study is being funded by the UKAEA.